1 scoop (32 cc per 1000 lbs.) 2 x day for first 14 days, then 1 scoop 1 x day top dressed on feed until problem is resolved. First 3-5 days it is ideal to dose with the oral syringe on an empty stomach. This protocol will help the horse the quickest. However if oral dosing is not tolerated by the horse, it can be mixed with a handful of feed am and pm. Oral Dosing - 1/2 scoop water with 1 scoop powder, shake well. Slowly administer across tongue so horse laps it up (powder will stain when mixed with water so administer slowly so you don't loose a drop). It is recommended to give one scoop am and pm when showing. 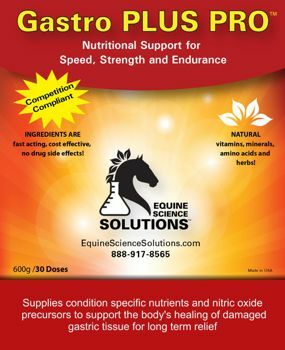 One scoop am is useful if you know the horse will be in an emotionally or physically stressful situation that day (lessons, trailering, overnighted). Once the body has sufficient amounts of Nitric Oxide and the ulcers are resolved you will notice a dramatic difference in the horses personality/behavior. You can then switch to the Ulcer Answer PLUS Supplement. UAP has all the vitamins, minerals, hoof and coat conditions that you would normally feed in a supplement plus condition specific nutrients to prevent the re-occurrence of ulcers, for under $1.00/day. UAP is top-dressed on feed once a day. Horses suspected of having poor gastric function should be given a course of Gastro Plus PRO to address the underlying problem prior to using Ulcer Answer PLUS for Maintenance. Gastro PLUS PRO for ULCERS: Gastro PLUS PRO supplies the precursors to trigger the horses production of the necessary neurotransmitters for increasing blood flow and the mucus required for a healthy stomach.